The Illinois Statehouse is looking festive this year, with its annual outdoor lights descending from the dome to the ground. But on the inside, things look a little less traditional. On the ground floor of the rotunda, between a Christmas tree and a menorah, there's a sculpture titled "Knowledge is the Greatest Gift." It depicts the outstretched arm of a woman, holding an apple, and around her wrist - a snake. It's the first display sponsored by the Chicago chapter of The Satanic Temple. One of the chapter's leaders explains what Satanists stand for: "Freedom of expression and self-determination, as well as the pursuit of justice." He says they're atheists who don't believe in a real Satan, and it’s all about the metaphor of Lucifer rebelling against religious rules. He spoke on the condition of anonymity and says Satanists have been the targets of hate. "I think it's important having our own voice within the rotunda. The state capitol has got such a rich history of freedom of speech," he told NPR Illinois. The secretary of state's office echoes that the issue is one of free speech, and says applications for holiday displays are open to all, and they are not funded with taxpayer money. The Chicago chapter of The Satanic Temple has about 150 members and was officially founded earlier this year, though its members started meeting in 2016. The sculpture was funded in part through a GoFundMe, which as of Tuesday had met its goal of $1,500. The group has also held fundraisers for charities, including ones that help foster and orphan children, as well as neglected animals. 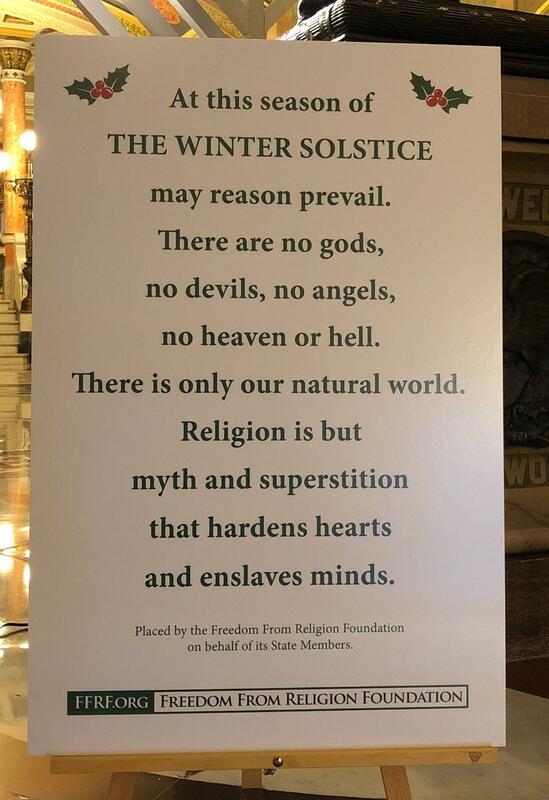 Also among the decorations is a sign from the Freedom From Religion Foundation. Past decorations have included a "Festivus" pole – a reference to a made-up holiday that was the subject of an episode of the sitcom Seinfeld.